After a spring like few days in Canterbury the weather has turned cool and wet again. It has been a dull and damp winter in most parts of New Zealand. The La Nina weather pattern has brought north-easterly winds, clouds and rain to the east of both islands. The resulting low sunshine hours and wet conditions have been ideal growing conditions for mosses. Mosses thrive in poorly drained lawns, paths, driveways and other places where there is shade and low light. In those areas where mosses are unsightly or replacing lawn grasses, a combination of using moss control products and changing the conditions will get rid of moss and prevent it returning. 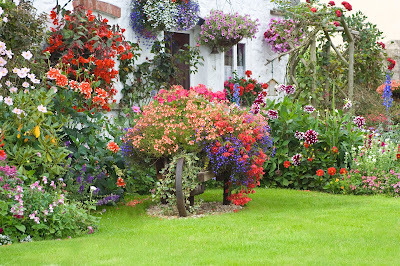 One place that mosses can be of benefit is as the lining to hanging baskets where the spongy water retaining moss will be both attractive and help to keep moisture in the basket. You might consider raking the moss from your lawn for this purpose prior to control. To get rid of moss first cut the lawn and allow it to recover for at least one day before treatment with NO Moss in Lawns moss killer. Dichlorophen will also control liverworts and slimes but will not harm the lawn grasses and it can also be used on paths, drives and other hard surfaces. Avoid cutting the lawn again for as long as possible and raise the cut height of your lawnmower to give the grass a chance to thrive and replace the moss. Once the moss has blackened and killed rake it out of the lawn or scrape it off hard surfaces. 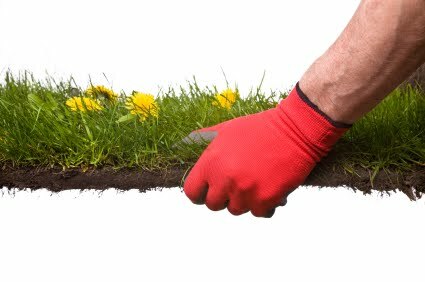 Then spike or fork the affected area of lawn to improve drainage and to aerate the soil. Cut back overhanging trees and bushes that shade the affected areas and re seed bare patches with grass. 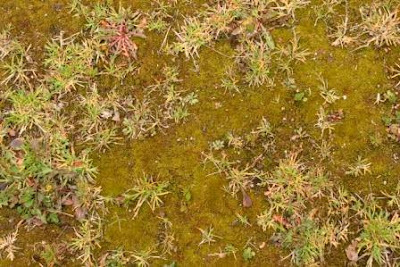 Moss growth can be a sign of poor nutrient levels in the soil and high acidity. In spring or early summer use a good organic fertiliser on the lawn to promote grass growth and test the soil to check acidity; add lime to increase the pH if the test shows it to be below 6.0. If possible keep off lawns when the lawn is wet in order to avoid compaction of the surface. In autumn, give the lawn a good raking to remove dead grass and moss and aerate again by forking or spiking. Apply top dressing at this time if the lawn is either uneven, or in need of an organic boost of nutrient. Liquid organic fertiliser will green up grasses at anytime and help reduce the opportunity for moss growth. There are many products for cleaning mosses, moulds and mildews off hard surfaces such as paths and driveways. These are split into the bleach type products and those containing actives such as NO Moss Mould Mildew. Benzalkonium does not just bleach the mosses and moulds but kills them down to their base and gives much better long term control. Why do mother kangaroos hate rainy days? Because then the children have to play inside. Nelson and the Tasman region is under 'attack' from another pest. After booms in rats and cockroaches there is now an incursion of the pest Great White Cabbage Butterfly. This is a pest that I am familiar with as I come from the UK. It is similar to but larger than the white butterfly that is common in New Zealand and also feeds on brassicas such as cabbages, kale, sprouts, broccoli, and cauliflower. It is likely to have been brought into NZ as stowaways on goods brought into Port Nelson. MAF Biosecurity are considering eradication options including aerial spraying but will be going ahead with searching sites and physically destroying pupae. Insecticide sprays are not effective against the pupae but the pupae are likely to begin hatching early next month. The pupae are black, white and yellow, are likely to be found close to host plants on fences and walls. Great white caterpillars are black and white, with yellow stripes, they grow to about 45 mm and tend to be found feeding in clusters. If you suspect you have seen these please contact MAF on 0800 809966. 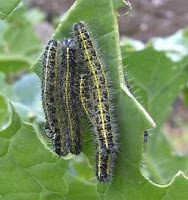 You can help to eradicate this invasive pest by treating any susceptible plants in your garden with Kiwicare's Organic NO Caterpillars. This totally safe product kills caterpillars of Great White and other pest caterpillars and can be sprayed on food crops and other plants with no withholding period i.e. the food plants can be eaten straight away. Who do you see if you have butterflies in your stomach? Do Whitetail Spiders Cause 'Flesh Eating' Ulcers? There is a change in the reporting of stories about whitetail spiders in the media and among professionals. The direction the media is now taking is that whitetail spiders are not a threat and those that continue the promotion of the ‘danger’ of white tails and necrotic arachnidism (ulceration due to spider toxins) are scare mongers. I have a personal view that there is ‘something’ to the reports of ulcers caused by white tail bites. The reports in medical journals and from universities, hospitals, etc. stating that there is no evidence for ulcers being caused by whitetail bites, all fail to discuss the possibility of bite infection carried by the spider rather than the spider toxin causing the ulceration. The evidence they use is collected from hospital records of admissions for spider bites or for ulceration. They have not found that those with confirmed whitetail bites show ulceration, but this is not surprising if it is caused by infection as the hospital would administer antibiotics as a matter of course. In the cases of ulceration they have not identified an infection, again because antibiotics would be administered and also because the causative agent may be difficult to culture. My own work on mycobacteria included culturing and identifying Mycobacterium ulcerans which as you might guess from its name causes just the sort of ulceration seen with the reported spider bites. The culturing and identification of this organism is notoriously difficult even for reference labs. It is even unlikely that hospitals would attempt it. If M. ulcerans is the cause of these ulcers then I would expect significant under reporting. M. ulcerans is, in my opinion, a prime suspect in the identification of the cause of ulceration attributed to whitetail spiders. M. ulcerans is a common soil bacterium and could easily be picked up by whitetails. Whitetail spiders actively hunt and predate other spiders specially the grey house spider. Both the whitetail and the grey house spider are normally found on the ground in soil and leaf litter. The jury is still out on the whitetail spider but I know I will be protecting myself, even if it is just from a painful bite, by spider proofing my house soon. Auckland Public Regional Health Service has warned people in the Hellensville-Kaukapakapa area of Northland, New Zealand, to be specially careful to avoid contact with rats as they have been found to harbour fleas carrying the disease murine typhus. Murine typhus is caused by the bacterium Rickettsia typhi. Flea faeces may contain the bacterium and infections are passed to humans by infection via the bite of the rat flea or other cuts and abrasions contacted by the flea faeces. Symptoms include fever, headaches, nausea and vomiting. Murine typhus is rarely fatal (2% of infected people may die) but can be very unpleasant for those affected. The onset of symptoms may not occur for for one to two weeks following contact with the bacteria. Prompt antibiotic treatment is usually sufficient to cure the disease. 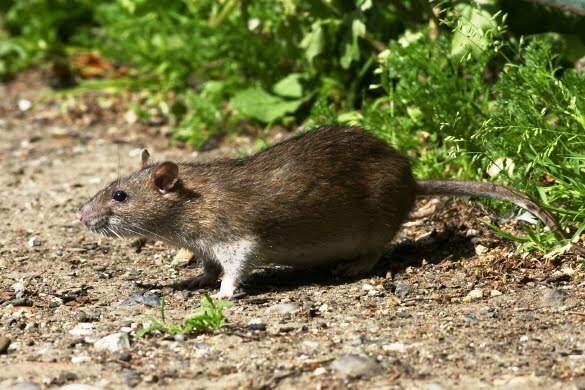 The public health department in Auckland is warning farmers, lifestyle block holders and others in the affected area to be pro active in ridding their properties of mice and possums as well as rats because these other pests can also carry the infected fleas. Preventative treatment against fleas in the home may also be a good policy to protect against infection. Is there one for vampires? I recently read an article in the NY Daily News that reported a poll suggesting that as many as 10% of New York homes have had an infestation of bed bugs. This is double the rate from 2009. The accuracy of such a poll, based on results of just over 800 adults, may be dubious, but it certainly suggests bed bugs are a significant and increasing problem. 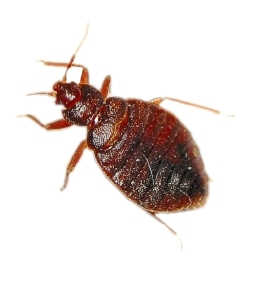 It may also suggest that as people become more aware of bed bugs, what they are and what the symptoms are they are becoming better at realising that they have an infestation. There have been several reports regarding bed bugs in the Big Apple recently including reports of infestations in high class stores and hotels. New York is not alone in seeing an increase in bedbug infestations. New Zealand may be isolated to some extent, but with the growth of bed bug infestations worldwide and the ease of travel, New Zealand is also seeing a significant rise in the affects of bed bugs. There is still ignorance among Kiwis about what bed bugs are, what to look for and how to prevent or deal with an infestation. You can protect yourself and greatly reduce the risks of bringing bed bugs home from travelling (in NZ or abroad) by treating your luggage with a long lasting insecticide specifically designed for the job (including IGR, insect growth regulator). And you can eradicate an infestation and protect your family by treating the places in the bedroom where bed bugs hide. It is important to use products formulated to deal with bed bugs and to be very thorough in your search for and treating of bed bug harbourages. What lives in big apples and is an avid reader? A big bookworm! It must be Friday afternoon..........it's raining! I am sitting in my office anticipating getting into the garden this weekend to eradicate the mosses and weeds that have thrived over the winter. Or at least that was the plan before the rain started. The weekend weather forecast is not good, so I might have to postpone for a few days. I will have to keep the NO Moss Mould Mildew I have for getting rid of the moss until a dry day comes along. The last time I used it I took some photos for use on websites to demonstrate its effectiveness. These are the photos. With any luck the forecast is inaccurate and I will be able to clean up the garden. I will also be trying some of a new trial product for killing weeds. It is an organic weedkiller with a novel and innovative combination of actives to give better control than is usually the case when using the safer and less eco-toxic herbicides. The Kiwicare BioGro certified organic range is growing and we expect to add two key new products in the next couple of months. The new herbicide and a new insecticide for controlling a range of insect pests on fruits, vegetables, roses and ornamental plants. Follow this blog and you will be the first to learn all about them. In the mean time, have a great weekend, where ever you may be. A weatherman walks into an isobar. If you are like me, you don't get as much exercise as you used to. I take the occasional walk or get in the sea for a swim in warmer weather. But in winter when I leave home in the dark and get back in the dark my exercise is limited to weekends and working in the garden or planting trees around Taylor's Mistake. As a result of all this couch potato behavior, when I do get into some serious exercise (like planting trees at Taylor's Mistake or getting into the garden for some of those spring has sprung chores) my muscles suffer and my body says I need more energy. Part of the problem is the lack of fitness and the inability of my body to get enough oxygen to my muscles and part of it is my muscles inability to get enough energy in the form of glycogen. The oxygen deficiency I have to work on by improving my general fitness and learning to breath all the way out so that when I breath in there is as high a level of oxygen in my lungs as possible; a tip given to me by a member of our office staff. Thank you Margaret. The energy deficiency I have learned to counter with La Vita Dextrose Energy Tablets. These tablets are a mouthwatering way to get a quick boost of glucose in the blood stream without having a load of stogy food in my stomach to digest while I am working. I keep a tube in the car for boosting energy levels while driving and countering tiredness, I keep a tube in my 1st Aid Kit in case I come across a patient with hypoglycaemia (low blood sugar) often caused by diabetes, and I keep a tube in my back pack for when I am walking or planting trees at Taylor's Mistake. What really impresses me about La Vita tablets is that they are wholly natural and really rather delicious. Try some and tell me if I am wrong. A man goes into a shop and picks up a bottle of fizzy pop and a bag of sugar. He pays for the pop and walks out. He is arrrested and taken to court for staeling the sugar. The juge asks him "Why did you not pay for the sugar?" and the man says "Because the label on the pop said 'Sugar Free.'" Mixing and diluting spray concentrates is usually a pretty straight forward task........or so you would think. It is perhaps because it seems so easy that some times not enough care is taken and mistakes are made. Remember that concentrates are by their very nature more active than the final spray and are therefore to be handled with some respect. Here is a simple guide to diluting concentrates for spraying, safely, with least waste and best efficacy. Protect yourself - Put on waterproof gloves and eye protection. We also advise wearing face mask, overalls and gumboots or similar during mixing and spraying. Liquids - Shake product well before use and let any foam settle. Powders/granules - Shake product gently to loosen and let settle for five minutes. Most sprayers have measuring marks on the outside. If your sprayer does not, then using a 1 Litre measuring jug, add 1 Litre at a time to the sprayer and mark each level with a an indelible marker. 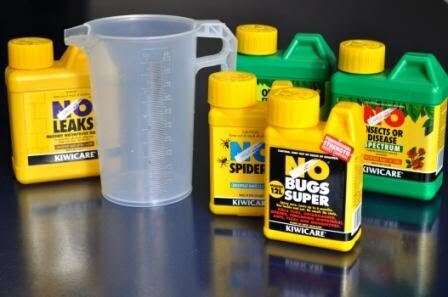 Measuring jug and sprayer - If possible use a 1 Litre measuring jug dedicated to the type of product to be used i.e. garden insecticide/fungicide, selective weed killer, non-selective weed killer, household insecticide, moss and mildew killer, etc. Rinse out measuring jug and sprayer with clean water. Quarter fill the measuring jug with clean water. Carefully add required amount of concentrate or powder/granules (to make final 5 Litres) to the water in the jug (if powder/granules- stir until dispersed). A cap full is approx. 15ml for measuring purposes. With clean water rinse out the measuring cap/cylinder into the jug at least 5 times. Add clean water to the jug until the level reaches 1 Litre. Add mixture to sprayer. Using measuring jug, add 4 more Litres of clean water to the sprayer. Using a jug is unlikely to cause foaming. If foaming occurs, slow the addition of water. Let liquid sit until foam subsides before completing filling. Do not let foam spill from sprayer. Sprayer only – Rinse sprayer with clean water. Add 1 litre of clean water to the sprayer. Carefully add required amount of concentrate or powder/granules (to make final 5 Litres) to the water in the sprayer (if powder/granules- stir until dispersed). A capful is approx. 15ml for measuring purposes. Using clean water, rinse out the measuring cap/cylinder into the sprayer at least 5 times. Add clean water to the sprayer until the level reaches 5 Litres. Note: If foaming occurs, slow the addition of water. Let liquid sit until foam subsides before completing filling. Do not let foam spill from sprayer. Cleaning sprayer, jug and stirrer – After use rinse the sprayer, jug and stirrer out with clean water at least three times. It is good practise to pump clean water through the spray nozzle to clear product from sprayer head and tube. If a diluent (solvent) other than water is used, the equipment should be cleaned with an appropriate cleaner such as household washing up liquid. It is also recommended that sprayer seals are checked and lubricated with petroleum gel, grease or similar to keep in good order. Mixing with diluents (solvents) other than water - Some Kiwicare products are not formulated to mix with water e.g. NO Borer Concentrate and NO Leaks Red Brick and Terracotta Sealant. And some products can be mixed with other diluents for better effectiveness, e.g. NO Spiders mixed with turpentine or NO Hydrocotyl mixed with diesel for control of re-sprouting stumps. In these case the process is similar to that described above but using the appropriate solvent. I hope this advice will help you get the best out of concentrates, stay safe, reduce spills and save you money. What do you get if you mix a bear with a cow? I have been watching with some anticipation the movement of buds on the rose on my balcony and the Camellia at the front door. There are also new leaves appearing on my honeysuckle and life is returning to many of the winter dormant plants in the garden. Here in Christchurch there have been several days of warm weather including very mild nights. The soil temperature is rising and days are lengthening. Has spring sprung? Perhaps that is thought is too optimistic as there is still time for some heavy frosts and cold weather to return. But the early signs of spring and growth of plants and weeds suggest to me that I should be protecting the new growth from attack by fungus and disease and dealing with emergent annual weeds before they get established. I have some NO Insects or Disease Spectrum Powder left from last year. As it contains systemic insecticide and broad range fungicides it will give excellent protection for the next few weeks as the plants come out of their winter slumber. 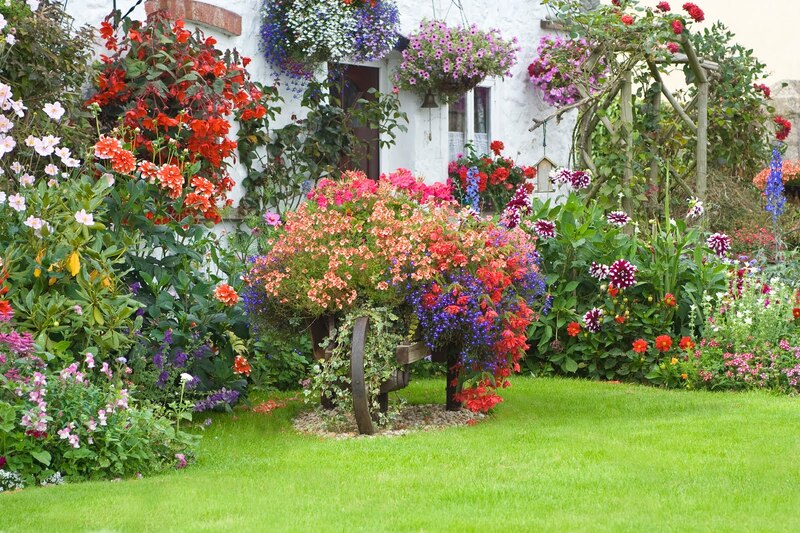 I will also be encouraged to deal with the moss and weeds in the lawn and on the paths and driveways. NO Moss Mould Mildew is great at clearing the moss and slime from hard surfaces without bleach and NO Moss in Lawns will deal to the mossy patches that have grown through the cool damp winter months. Once the moss has died I will scarify the lawns to remove the dead moss and clear out the dead grass that would otherwise provide fungus and other diseases a place to form. Broad leaf weeds and annuals are appearing in the lawn and in the gravel driveway so I will give the lawn a treatment with NO Lawn Weeds Turfclean and the driveway with NO Weeds Longterm liquid weedkillers. Turfclean is a selective herbicide that will kill the weeds without harming the grass and the Longterm Liquid Weed Killer gets rid of the existing weeds but also prevents new weeds germinating for some months, saving me from time, effort and a weedy driveway and paths. During late spring one year, a blonde was trying out her new boat. She was unable to get her boat move in the water, or do any maneuvers whatsoever no matter how hard she tried. After trying for over three days to make it work properly, she decided to seek help. She took the boat over to the local marina in hope that someone there could work out what the problem was. At the marina some boaties looked the boat over an couldn't find a problem. Everything from the engine to the steering was working perfectly on the deck of the boat. So, a puzzled marina employee jumped into the water to check the hull for problems. He found the trailer still strapped to the boat.